When I first started, I thought, “Psh. This is going to be easy.” I charged my first client $25 and quickly learned that I was in way over my head. Way. She was a well-known blogger on her way to an even bigger breakthrough. Thankfully, she did not blast me on FB. I’ve done several projects for her since then, and now we just laugh about our “in the beginning” days. We’ve both learned so much, and I want that to be your testimony, too. Susan K. Stewart is a fellow Texan, editor, author, speaker, and e-course creator. 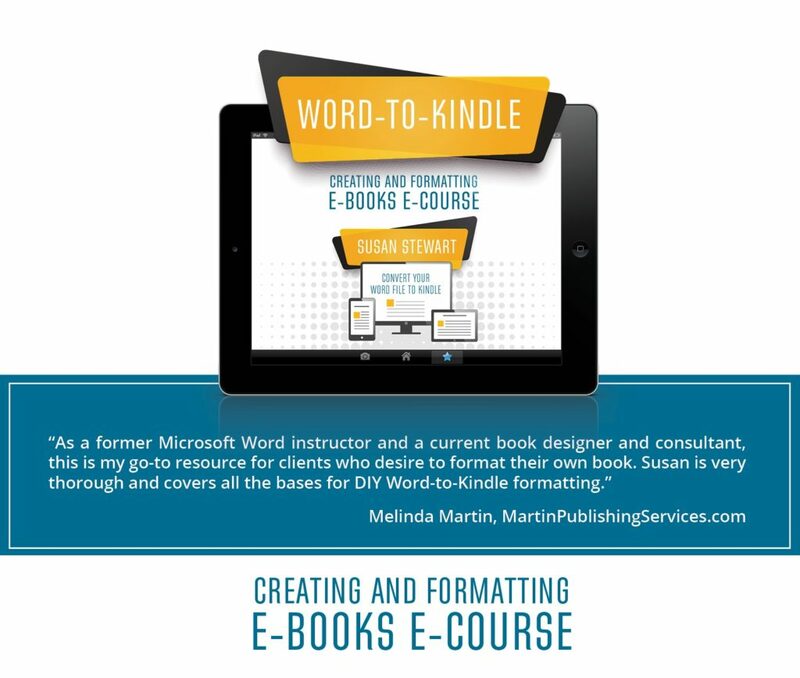 Susan not only has a book, “Formatting e-Books for Writers: Convert Your Word File to Kindle“, to help the DIY self-pubber, but she has an accompanying course as well, “Creating and Formatting e-Books“. This course will cover the basics of formatting, file conversion, various publishing options, and more details of creating and selling your e-product. You will go through the steps necessary to make a Kindle product from your completed manuscript. After completing this class, you will be ready to upload your e-book for sale. There are other courses out there, but Susan’s course is NOT a set-it-and-forget-it email class. She offers personal attention when class members have a question. In the past week, I have consulted with two people who wanted to tap my brain about becoming a book designer. This course will give you a huge leg up, whether you want to create books for yourself or for others.